SAGEBRUSH SAFARI is back for the second year under Quick n’ Dirty. The course for this year is relatively the same with a couple modifications. It comes to you at just over 26 miles and 3600ft of climbing! This folks is true cross country course. For the Beginners that aren’t used to that much time in the saddle we are also offering an 18 mile course. As an added bonus we will also be having a Super D race on Sunday! You can race one day or both, it’s up to you! The Sagebrush Safari course is on multi-use trails and public roads. This means that you may encounter off-road vehicles and dirtbikes, as well as vehicles on the paved roads. We will do our best to limit the traffic on the trails and roads, but we cannot forcibly stop people from using them. Please ride with caution and be courteous if you encounter any on or off-road traffic. This address will take you further up Corral Canyon Trail but will take you right by the venue. If you are using GPS to get there don’t go all the way to the address, make sure you stop where the fun is. Don’t go past the Navy’s Camp Morena facility, it will be on the right, across the street from the venue. We highly encourage everyone to save a little time and money and please register Online. Using Online registration makes race day flow much easier for both the organizer and the racer. With rising costs of everything we truly do hate to charge more onsite, but we have to make it fair for the people that took the time to register online and paid the service fee. If you want to race both days and save a little money, please register for the Cross Country Race (XC) Race first. In your race confirmation notes there will be a discount code for the Super D race. A $$ purse is being sponsored by our friends at VELOFIX SAN DIEGO NORTH COUNTY! Scroll down to the XC section for specifics. A $$ purse is being sponsored by our friends at VELOFIX SAN DIEGO! Scroll down to the XC section for specifics. A $$ purse is being sponsored by our friends at SPANK Industries! Scroll down to the Super D section for specifics. Hammer Swag bag with good stuff! As depicted on the Trail Map above you will start out at the venue, just across the street from the Navy’s Camp Morena at around 3000ft. Once the gun goes off you will be sent on a 6.5 mile climb up Morena Stokes Valley Rd to 4 Corners, then up Los Pinos Rd, just near the top of Los Pinos mountain (4600ft). After you catch your breath and take in the glorious views, get your legs ready for one of the best descents Corral Canyon has to offer, Spur Meadows Trail. After roughly 4 miles of descending you will end up back on Morena Stokes Valley Rd and arriving once again at 4 Corners. From here you will jump on Wrangler Trail. This is the trail that makes the Sagebrush Safari as epic as it is. You will experience many types of terrain to include loose dirt, hard pack, massive rock slabs, rock gardens, punchy climbs, and flowy descents. After about 4 miles on Wrangler Trail you will reach Skye Valley Rd. After a few minutes you will hit Bronco Flats Trail, then another few minutes later you will hit a new section called Ranger Trail. For those of you who have raced the Safari in the past know that this where you would normally hit the dreaded hike-a-bike. Not this year! 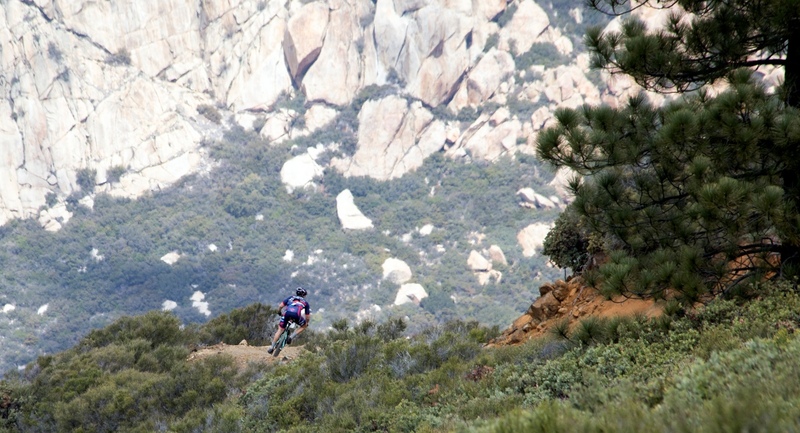 Thanks to Ranger Trail you can now stay on your bike and enjoy a technical, yet rideable climb, up to the next section. The next section is one of the most fun fire-roads you’ll experience, Gunslinger Trail. After your done having fun on Gunslinger you’ll reach Morena Stokes Valley Rd and for the final time make your way back up to 4 corners. Once you reach 4 corners you can start thinking about cracking open that tasty beer (or favorite non-alcoholic beverage) and jump right on to Kernan Cycle trail. Kernan is the final descent back down to the paved road. Once on the paved road you’re roughly 2 fast miles to the finish line. 18 mile course racers will do everything except the Los Pinos climb and Spur Meadows Trail. So once you reach 4 corners on the initial paved climb, you will head out on Wrangler Trail and follow the course from there. The Super D course Start Line will be at 4 corners and descend down Kernan Cycle Trail, you know this trail has it all! The finish line will be at the bottom of Kernan Cycle Trail at the paved road. All Super D racers will get two runs and the racer with the fastest combined times will win. All Super D riders will have to tough-out the climb to 4 Corners. The climb is approximately 2 miles from the Finish Line up Morena Stokes Valley Rd. Granny gear and few friends climbing with you to help to pass the time away will get you to the top! We are trying to lock on a shuttle, but at this time everyone has to ride up. We are trying to setup a 3 run format on multiple trails. We are still working logistics and approval so please stay tuned for more information.